Pork tenderloin gets cooked around here quite a lot. Normally its a bit of a no-thought-needed item to throw on the grill. This time I wanted to stir things up a bit. First I decided upon some flavors (apple, pecan, whiskey, maple syrup) and set about figuring out how to combine them. I ended up stuffing the tenderloin with the apple and pecan, and saucing it up with the whiskey and maple syrup. Since it turned out so well I thought I’d share it. For the stuffing, sautee the onion and chopped pecans in a decent amount of butter. After the onion goes translucent add the diced apple and sage. Let that cook till the apple softens a bit and then add the toasted bread cubes. Off the fire, lid on, set aside. In the meantime slice open the tenderloin in a sort of upside down Y and then open it up. 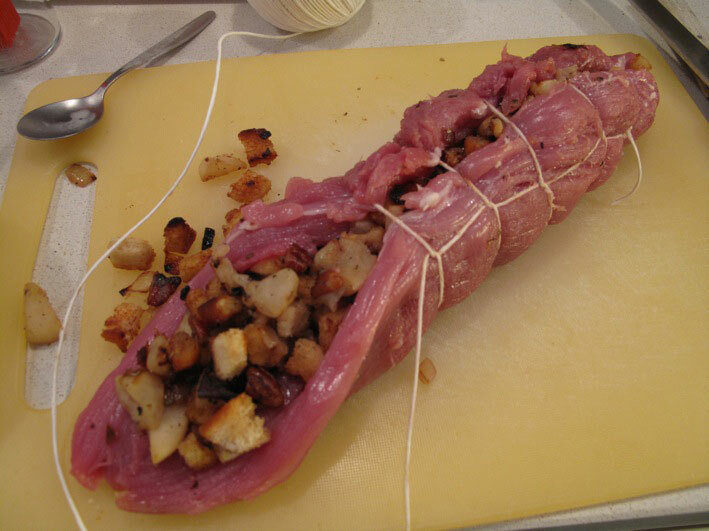 Heap the cooled stuffing onto this sheet of meat, fold it closed, and attempt to lace it up. A third hand can be useful. After that, season the meat with fresh ground black pepper and sea salt. Cook indirect (not above the coals, with the lid closed) and baste several times with a 50/50 mixture of whiskey and maple syrup. Sauce: as usual I didn’t take notes on the sauce so this is an approximation. 1/3 – 1/2 cup whiskey depending on how boozy you want it. Sautee the onion in a tablespoon or two of butter. Deglaze with the whiskey. Let that reduce to 50% and add the maple syrup and cream. Simmer until its the desired thickness (stir frequently) then run the sauce through a sieve. If you do make it too thick, don’t try diluting it with more whiskey. Don’t ask. good to see another post on here, the tenderloin looks great! want to subscribe to The Smoking Bottle by email?